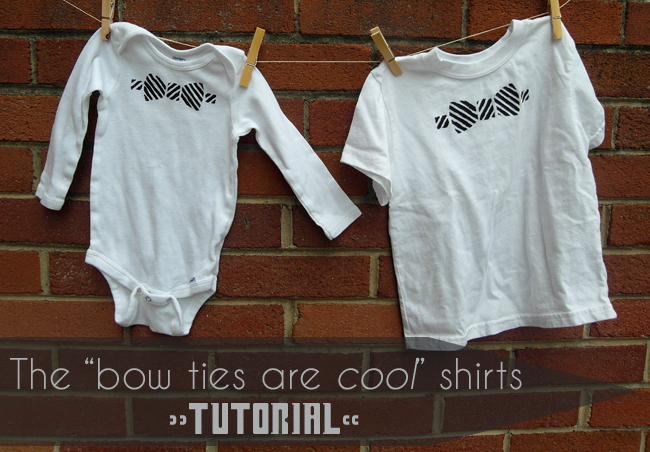 ' the "bow ties are cool" shirts [and onesie] - Tutorial - Sisters, What! My Dad and brother share a birthday and they both love to wear bow ties, so I thought it'd be fun to make them some shirts with bow ties on it. Basically they can now wear bow ties when they're relaxing, working in the yard, playing with the kids/grandkids, etc. I used my favorite freezer paper and fabric paint method, which is really easy and fun to make many designs on shirts with. Of course, after making them shirts, I also had to make one for the little guy. But I couldn't stop there, I also had to make a onsie for the coming baby brother. 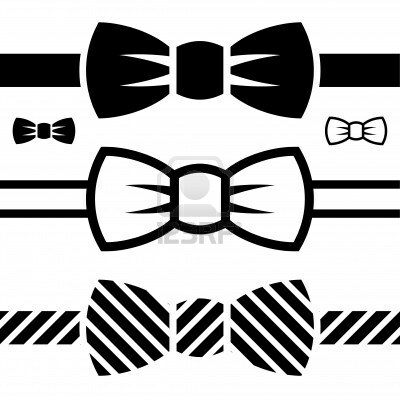 //1// [a]First you need to measure your shirt and decide how big you want the bow tie/design to be. Then in photo shop (or other photo program) or word, change the design to be those dimensions (its ok if it is pixelated). [b] Now cut your freezer paper to the size of 8x11 (you can tape it cardstock paper to make it more sturdy when printing, but make sure you tape the shiny side down) and feed it in the printer so that the design prints on the NON-shiny side. This is important because you'll need to iron the shiny side on the shirt. 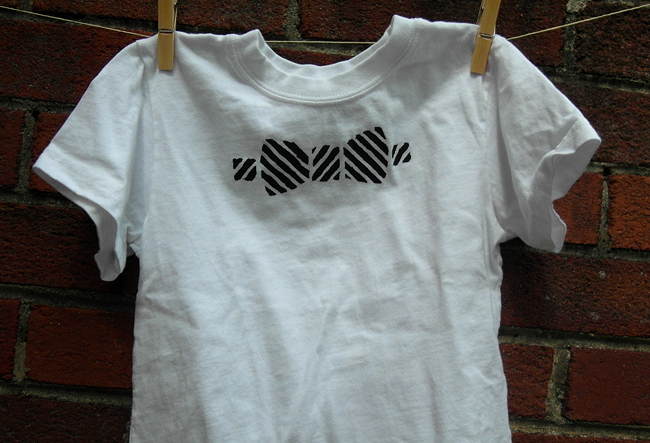 //2// using an exacto knife, cut away the parts of the design that you want painted on the shirt. 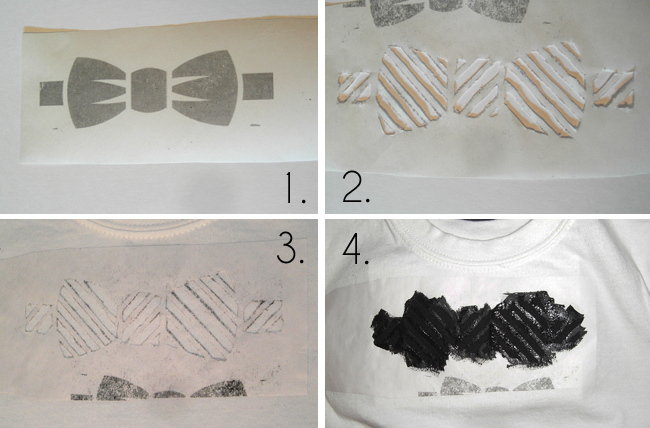 //3// Iron the freezer paper onto the shirt where you want it placed. //4// get your fabric paint and sponge brush and apply the paint to the design. Allow to dry completely (can take 1-3 hours), then remove the freezer paper from the shirt. And your done! 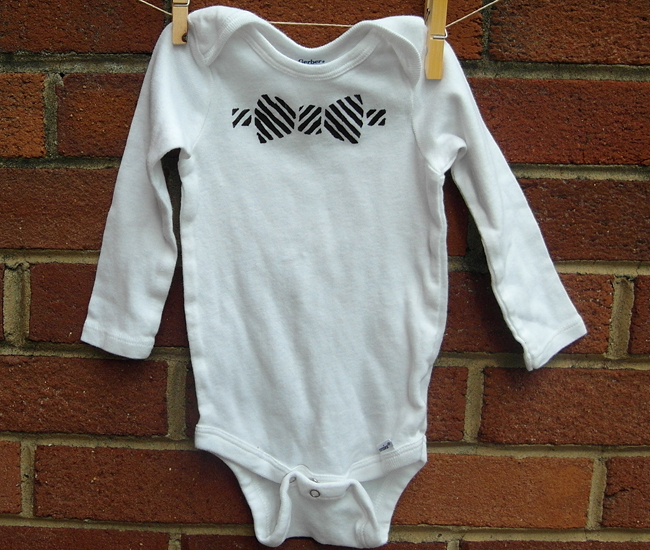 How cute to see a babygro with a bow tie. Clever.